Update: SnoringHQ readers get a special discount with Coupon Code: SnoringHQbed. Use the code to receive 5% OFF your order of mattresses and toppers. Includes all FOR SALE and promotional items. It is well-known that Americans do not get enough sleep. Our lack of sleep is the result from overwork – along with bad lifestyle habits. One severe bad habit is ignoring the mattress as an essential part of life. A quality designed mattress ensures a sound, restful sleep. It can help reduce snoring and serves as a defense against back pain. A new entry into the high-end mattress market is the LevelSleep TriSupport Mattress. It is a top-notch mattress that I can enthusiastically recommend. The fundamental principle behind this mattress is based on the curvature of our bodies. The designer, Roger Sramek, realized that when sleeping in a curved position on your side or sleeping on your back, the body parts need varying levels of support. Following the successful design of the Restore Pillow, Sramek designed the TriSupport mattress. It provides the appropriate support to the head, shoulders, lumbar region, and hips. The shoulders receive soft support, the hips receive medium, and the lumbar region firm. The combination provides an excellent night’s sleep. The mattress’ main design feature is its focus on zones, not layers. Each zone is designed to provide the right pressure for each part of the body. 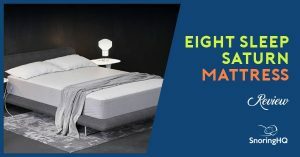 Rather than relying on layers of air, springs, or memory foam, as most mattresses do, the LevelSleep concept focuses on where each part of the body lies on the mattress. 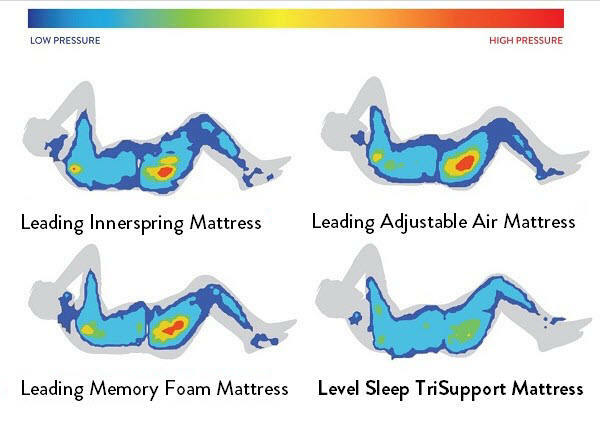 During the research leading to the TriSupport Mattress, Sramek and his team found problems with the different types of mattresses that were available on the market. Adjustable air mattresses can end up with a central trench because of the separate air bladders they contain. Deflation of the air chambers is also a problem and the mechanical parts, if they don’t consistently work, can be a hassle. They tend to put significant pressure on the hips and noticeable pressure on the shoulders. Innerspring mattresses may not last as long as others. Additionally, because they are on springs, the squeaking and movement can bother you or your partner, and most require extra padding for full comfort. Memory foam mattresses may form trenches because the foam tends to pack down. Due to the density of the memory foam, the foam retains heat. In addition to heat, memory foam may also absorb smells. Additionally, it tends to restrict movement—you may struggle to get out of bed in the morning. And most other mattresses do not provide any spinal alignment. To ensure proper spinal alignment for both side and back sleepers, the TriSupport Mattress has four parts designed for support and one for comfort. The 7” Base Layer provides the mattress’ foundation. It is made of a long-lasting foam which is both breathable and sturdy. It can lie on any flat surface to support the Performance Layer. The top of the Performance Layer is made of soft foam. It gives for your shoulder, reducing the pressure on your shoulders and upper torso and, coupled with a good pillow—such as LevelSleep’s Restore Pillow or the Nectar Pillow, will ensure a well-aligned sleep for your head, neck, and shoulders. The firm section of the Performance Layer supports the lower back and sides. It is made from a firmer latex foam and provides the right support for our weak spots, reducing back pain. The balance of the mattress provides medium support for your hips and legs. The pressure on your hips is reduced, helping them stay aligned with the rest of your body and spine. The comfort part of the Performance Layer is the fabric cover. It yields when you sleep on it and is made of material that is both breathable and comfortable. The Base Layer consists of high-resilience polyurethane foam. LevelSleep also sells a TriSupport Luxe Mattress. 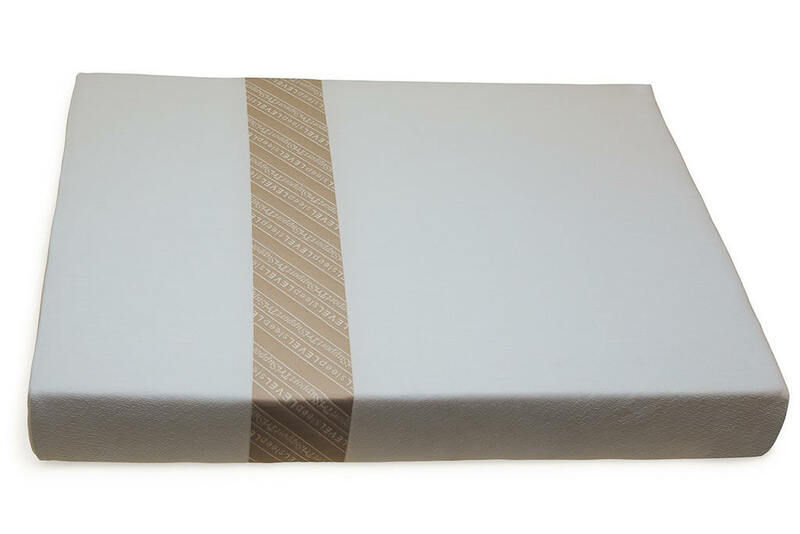 The Performance Layer is made entirely from Talalay Blended Latex from Talalay Global. Talalay-process latex resists compression more than Dunlop-process latex, preventing you from ending up sleeping in a hole. Talalay latex is also less likely to lose firmness over time. The latex should not bother those with latex allergies. The foam provides a springier feel. Traditional mattresses are made with an array of toxic chemicals. Since you sleep on your mattress every night, you could be putting your health at risk. The Levelsleep mattress is made with non-toxic materials so switching your mattress to a Levelsleep mattress is an excellent way to decrease your exposure to toxic chemicals. 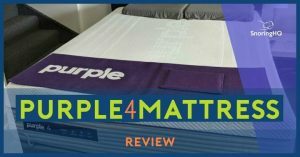 Be sure to also read our review of the new Purple 4 Mattress. LevelSleep scores the lowest for disturbed sleep by mattress type. The LevelSleep mattress is designed to avoid causing back pain, for both back and side sleepers. If you sleep on your back, you will likely have back pain because your lower back is not supported. While the mattress supports your shoulders and pelvis, the spine sags, stressing the soft tissues. Side-sleepers suffer back pain because their spine twists. The shoulders sink into the mattress, causing a bend in the spine between the shoulders and pelvis. A study by the Canadian Chiropractic Association indicates that lumbar support is critical for spinal alignment and controlling back pain. With the Levelsleep mattress, pressure is more evenly-distributed across pelvis, back, and shoulders. The three-part design of the mattress led to a 54% reduction in morning stiffness, as reported in the clinical trial conducted by the company. The medium-soft shoulder zone of the TriSupport mattress absorbs more of the shoulder’s weight than other mattresses. Spreading the pressure around more makes sure that blood flow remains normal. Clinical trial participants report a 56% reduction in morning pain. The company’s clinical trial found that the three-zone method helped reduce tossing and turning, and participants reported significantly less fatigue and daytime sleepiness. Clete Kushida M.D., Ph.D. of the Stanford University Sleep Disorders Clinic and Research Center created the trial. It was conducted by Cheri Mah, now at the UCSF Human Performance Center. 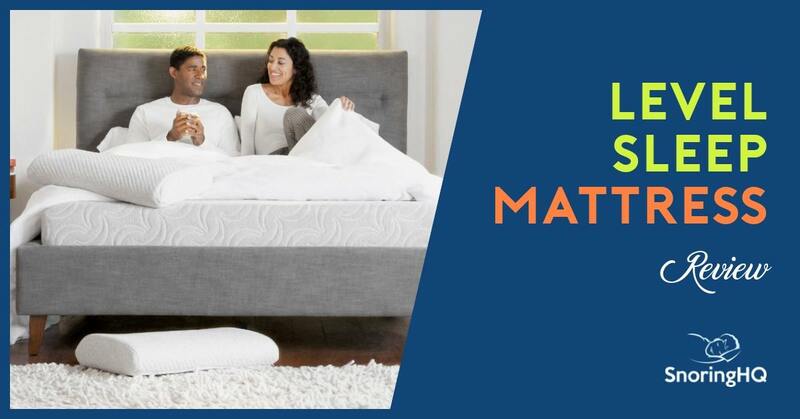 Using both objective measures and subjective data provided by recognized sleep questionnaires, the study found that the TriSupport mattress outperformed all other leading mattresses. People got to sleep faster, woke up less, reported less pain and stiffness, and noted a much higher sleep satisfaction. The mattress is available online or through a network of outlets throughout the country. Most of the outlets are chiropractic clinics. The mattress weighs between 49 – 109 pounds. Each mattress comes with a 110-night money-back guarantee, and they recommend everyone try it for at least ten nights to become accustomed to the new feel. The company also offers an 11-year limited warranty. The reviews given by customers have mainly been five stars. Before buying check our list of Level Sleep coupon codes. The mattress is sourced from products made in America and is made in the U.S. Experience the comfort of the mattress at their center in Sonoma, CA. 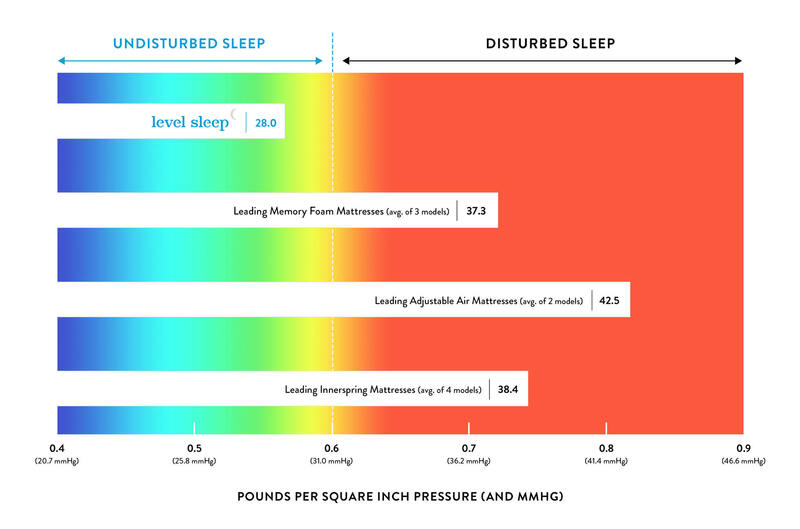 A visible representation of LevelSleep pressure on the back VS. other mattresses. Despite the weight, the mattress was easily set up and shipping only took one day. The company accepts PayPal, and if you have PayPal credit, you can finance the purchase. You will feel the lumbar support when you lie down, and the mattress visually displays where the support zones are. No other mattress in my experience has provided as much lumbar support and spinal alignment. It is clear why chiropractors recommend and sell this mattress to their patients. This incredible mattress gives wonderful healthy support for your spine. It may take a few nights to get used to the new routine, as the company notes in their guarantee. On my first night, I noticed a slight tenderness in the lower back, but the tenderness was gone by the second night. I woke up refreshed and full of energy, and I look forward each night to lying on this comfortable mattress. It will be very difficult, if not impossible, to go back to another mattress after this experience. While the mattress is pricey—a queen TriSupport is $1,899—having a healthy, comfortable night of sleep for $172 per year for the 11-year guarantee is certainly worth the investment. My wife also tried the mattress. She was surprised at the support and comfort, and her minor neck pain felt better after one night. I would rate this mattress, overall, as a “firm” mattress, but it supports the body in all the right places. It is exceptionally comfortable, and the user awakes feeling refreshed. The memory foam in this mattress is of excellent quality, and you can experience the high quality from the first night. You know you are lying on something special because of the differing levels of support and pressure. The three-zone structure actually works. It makes sense in so many ways—sleep science, comfort, and health. The design and engineering are astounding, and it pays off. This mattress can solve your back or neck problems. It strikes a perfect balance between back support and comfort. SnoringHQ readers get a special discount with a Mattress Coupon Code: SnoringHQbed. Use the coupon code to receive 5% OFF your order of mattresses and pillow toppers. Includes all FOR SALE and promotional items.